At the office of Betty Klement, DMD, we provide patients with effective and convenient teeth whitening options to achieve a beautiful, radiant smile. Patients who whiten their teeth at our Orange Park practice receive quality care utilizing the latest in dental technology. Our dental team believes that improving your smile’s aesthetic with our brightening services gives you a boost of confidence. Call our practice today to schedule a consultation with Dr. Betty Klement to discuss which option is best for you! Teeth whitening treatment is a simple and quick solution to rejuvenate the smile. Teeth may develop discolorations for a variety of reasons, such as consuming dark-colored foods and beverages like red wine, beet juice, and coffee. These stains may become more apparent as we age, making professional brightening kits a sought-out service as it enhances teeth’s appearance using a minimally invasive method. ay take several months to accomplish and only lasts a short while. We accommodate our patients’ dental needs and lifestyles by providing multiple brightening options. 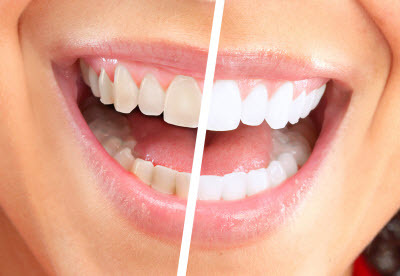 In-office whitening allows patients to leave our practice with an improved appearance by having their teeth professionally whitened by our dentist. We also provide patients with custom appliances once they leave their appointment so they may continue maintaining their whitened smile at home. At-home whitening is available as strips, preformed trays, or custom trays. These take-home options give patients a professional-grade whitening agent and the ability to brighten their teeth at a convenient pace. Each option provided by Betty Klement, DMD, has its own advantages. Depending on your dental needs, our dentist suggests the best option for you. We believe in giving each patient individualized care to ensure they have a quality experience and view improved results as quickly as possible. If you wish to gain a bright smile through teeth whitening treatment, contact Betty Klement, DMD. Our Orange Park dentist enjoys seeing patients receive a boost of confidence by renewing the luminosity of their teeth.